Grizzly is one of the most reputable brands on the market today and offers a wide range of table saws with a number of highly useful features. In this article, I intend to shed some light on different types of Grizzly Table Saws, their features, and their upsides and downsides. One of the best things about these table saws is the number of different choices available - you can pick a simple jobsite table saw, a hybrid cabinet saw, a contractor style table saw, a heavy duty cabinet saw, or a stylish, fully equipped sliding table saw. The cost of Grizzly table saws differs greatly - from a few hundred dollars to a few thousand dollars - depending on the model and the kind of features available. Let us take a detailed look. If you are looking for low end woodworking saws, the 10" table saws from Grizzly would be a good choice for you. They come with a powerful 1½ motor, a heavy duty cast iron table, powder coated metal wings, miter gauge with adjustable bar, easily adjustable fence, large dust hood, fence mounted switch, regular and dado blade inserts, and a cast iron motor pulley which reduces vibrations considerably. A number of reviews suggest that the blade in this type of Grizzly table saws is really good and offers great cut quality. Unlike most other saws in its class, these saws do not make a lot of noise. The fence is quite good and once locked, it stays locked as long as you want. A couple of things that might slightly disappoint some people, according to some reviews, are the miter gauge and the riving knife. But these are minor issues and the positives definitely outweigh the negatives in these table saws. This type of Grizzly saws come with a solid 3 HP, 220 V motor which is powerful enough to rip through sheet after sheet of hard plywood. Other features include cast iron table, cast iron trunnion, dust port, T slot miter gauge, cam-locking fence, riving knife and a blade guard, and a polished cast iron top. Almost all the reviewers mention that these saws are sturdy and they operate without any vibration, which is quite neat. The extension frame seems to be the only weak point of these saws. Some reviewers feel that a square tube frame under the extension would have been a good idea. Apart from this, the reviews have been very positive for this type of Grizzly table saws. These table saws come without the extension tables and the long rails and are ideal for people who have limited space. The features include a 7½ HP 3 phase motor, cast iron trunnion, digital readout for bevel angle, precision ground cast iron table, a 12" blade, and a dust port. This type of Grizzly saws are a good choice for people who want all the features of a regular 12" table saw, but do not need the long rails because of space constraints. These saws are sought after by a large number of professionals. These saws are high priced, but come with a truckload of features which make them a very useful addition to your business. Important features in these types of Grizzly table saws include micro adjustable tip fence, scoring saw blade, a main dust hood and an upper dust hood for efficient dust collection, safety limit switch, adjustable riving knife, magnetic switch with thermal overload protection, and more. The main blade offers up to 6000 RPM and can rip hardwoods easily. As you can see, Grizzly Saws offer you an unbelievably wide range of features. 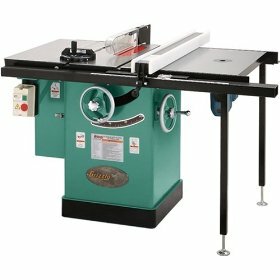 A lot of reviewers have mentioned that these table saws are of very high quality and are very reliable too. So, in my opinion, they can be a good choice for business. Return From Grizzly Table Saws Page to Home - Finishcarpentryhelp.com.